After three years in prison, Shadow has done his time. But as the days, then the hours, then the hours, then the seconds until his release tick away, he can feel a storm building. Two days before he gets out, his wife Laura dies in a mysterious car crash, in apparently adulterous circumstances. Dazed, Shadow travels home, only to encounter the bizarre Mr Wednesday claiming to be a refugee from a distant war, a former god and the king of America. Together they embark on a very strange journey across the States, along the way solving the murders which have occurred every winter in one small American town. But they are being pursued by someone with whom Shadow must make his peace... 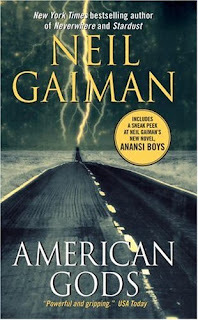 Disturbing, gripping and profoundly strange, Neil Gaiman's epic new novel sees him on the road to finding the soul of America. Well, I finally read a book by Neil Gaiman that I actually liked. I had just assumed that he was an over-rated writer or that I had something wrong with me but I really enjoyed this book. Granted, The Graveyard Book was okay but I had hated Neverwhere. The problem seemed to be little to no real story and being weird for weird's sake (Tim Burton does this sometimes, too). But I did enjoy this story. The main character of Shadow gives us an everyman to pull for amongst all the old god vs. new god madness taking place around him. The mystery plot interwoven throughout the story was also a nice touch. What am I saying? Am I going to read another Gaiman book? Maybe. I've been thinking I'd like to try Stardust. I liked the movie.